Tip #2: DON'T SWEAT THE SMALL STUFF! Y'ALL. I am OCD. I struggled most of life with perfectionism (thank you competitive figure skating) and I have fought long and hard to overcome several of my OCD tendencies. I have chosen to live in the freedom in not over analyzing and stressing about things that really don't matter. Most people don't notice the things I used to fret about! Every once and awhile the OCD pops out (*ahem* when I'm styling my hair), but it definitely has gotten much better! When it comes to weddings-- THIS IS NOT A GOOD PROBLEM TO HAVE! I remember spending many painful hours trying to make every little DIY part of my wedding absolutely perfect. Down to the puffy paint dots on 6 inch high lighthouses! Time I didn't really have as I was a senior in college, student teaching full time, completing a massive portfolio, and also planning for a new house and marriage with my now husband. Ridiculous! Such a waste of time. Here's the kicker: NOBODY NOTICES, NOT EVEN YOU! 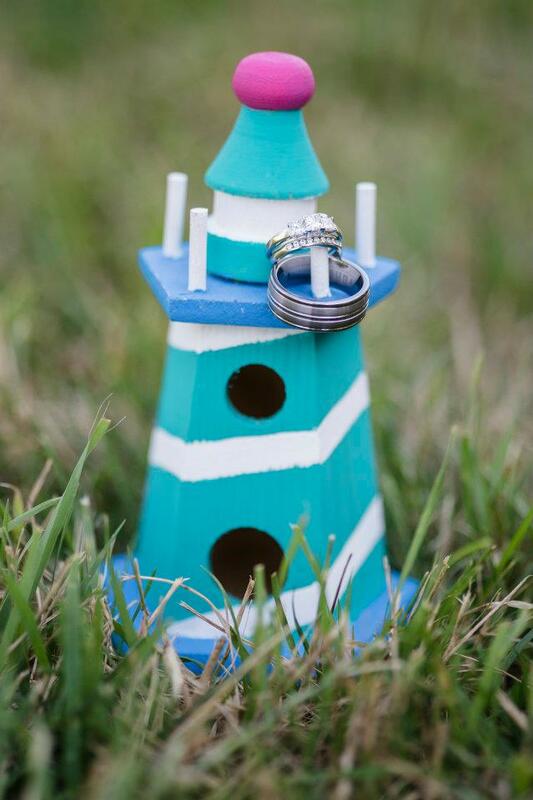 I don't recall seeing those lighthouses mentioned above on my wedding day, as I don't remember seeing many of the little details I planned on my wedding day. I have pictures to look back at (thank goodness!) and that's about it. If you think about previous weddings you've been to, most likely you will remember what the bride and groom looked like, the food, and hopefully the dancing or some other special conversation or moment throughout the day. You'll remember "oh yeah, this was pretty and that was nicely done", but you won't remember specific minscule details. Funny story about those lighthouses... I still have ONE left on display in my house.. just because I CANNOT bring myself to throw it out (even though I had to throw the other ones away because we didn't have room for mini lighthouses to go all over our house). It's a good reminder for me whenever I start to become tempted by perfection to LET IT GOOOOO! (cue Idina Menzel) And it's pretty darn cute so why not keep just one. Point being.. the rest went to the dump. Wah wahh. Happy Crafting & Happy Monday y'all!